Like many other UK Higher Education Institutions, The University of Manchester is ramping up its current distance learning provision as a means of simultaneously expanding student numbers, offering greater flexibility to students and increasing global reach and reputation across the globe. This change in pedagogical emphasis has been underway for a couple of years now, and a number of high-profile campus-based postgraduate programmes are currently being converted into a distance learning (or as we prefer to say a location-independent learning model). As a relative newcomer to the world of distance learning, The University of Manchester has been working quite closely with Penn State University in the US, who have a renowned and well-established World Campus which delivers quality online courses at undergraduate, masters and doctoral level. Last week we were privileged to host two senior Penn State University (PSU) staff members at our School of MACE Teaching and Learning Community of Practice – where the topic under discussion was distance learning: an academic and instructional design perspective. As an academic who is currently wrestling with the transition of an existing campus based programme to distance learning, I found the seminar hugely useful. My aim here is to share what I learnt with the wider community at The University of Manchester and beyond. The seminar was run using Fuze webinar software, and allowed for a pretty seamless set of presentations with lots of opportunity for questions – not bad considering the presenters, Dr Peter Forster and Amy Garbrick were on the other side of the Atlantic Ocean. There are three key pillars of successful distance learning for large campus based institutions – quality content, strong marketing initiative and institutional commitment. 1) Quality Content can be broken down into faculty engagement, robust course content, a strong learning design team and good student support. It was clear from Penn State’s experience that distance learning has to be a “coalition of the willing”; drawing on engaged faculty and providing adequate opportunities and incentives for staff to keep them engaged. Identify those academics with a passion for improving their teaching practice and harness that for distance learning; perhaps by showing that distance learning pedagogy and tools can often be transferred back into campus-based teaching. 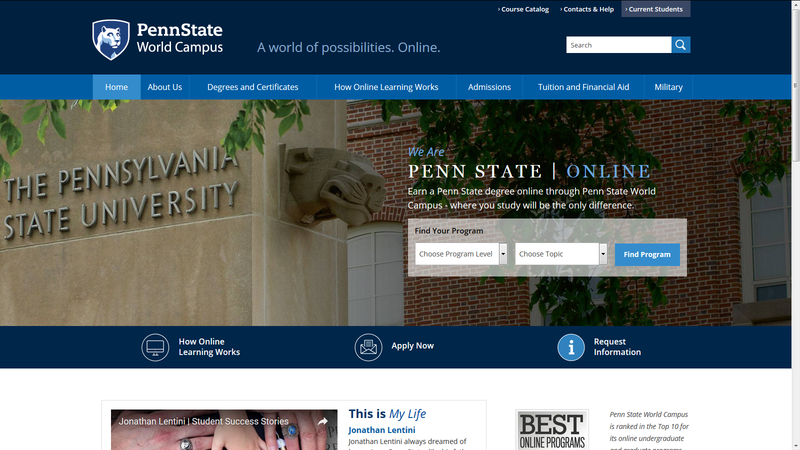 The stark message from Penn State was “Don’t force staff to do distance learning”. For example, they tend to avoid using early career or tenure track faculty to do distance learning due to the multiple and competing pressures on these academics. Secondly, course content needs to be robust. PSU has a consistent policy of not enrolling students onto a programme until the content is ready. Sounds obvious, but haven’t we been tempted to market courses whilst the material is still under development. Content robustness can be further improved by giving dedicated student testers ample opportunities to interact with material pre-launch, and by asking students to collate and curate their own content. The third component of quality content is the presence of a strong learning design team, who are experienced, innovative, understand distance learning pedagogy and can proffer advice to faculty on the most appropriate assessment techniques. The learning design team (there are upwards of 100 instructional designers or eLearning technologists involved in DL at PSU) also provide standardised course structures, a common nomenclature and shared knowledge bases to support academic staff. Underpinning this learning design expertise is ‘industrial strength’ technology that should not fall over. Last but not least is the requirement to provide excellent student support. At Penn State students are supported in 3 ways: by their academic tutors, by professional administrators and by the programme management team. Student queries are responded to within 24 hours; grading is done within 48 hours of submission. Now there’s a challenge for us! Both presenters stressed the importance of institutional commitment to successful distance learning. Transitioning to distance learning in a research intensive institution simply will not happen if led by individual academics operating at the local level. The twin demands of research and campus-based teaching will overpower small distance learning initiatives unless they are supported by an institutional wide strategy that is adequately resourced. This commitment needs to be an academic, administrative and financial one. Staff may need to be incentivised to participate in distance learning, and given time to develop content. Dedicated instructional design teams will be required to support the academic content curators and build the courses. Senior management pro-activity and commitment will be needed to integrate distance learning into the fabric of a traditional higher education institution. Neither quality content nor institutional commitment alone is sufficient to build successful distance learning programmes. These two pillars must be joined by a third; that of strong marketing initiatives. Penn State works extremely hard to market its courses to existing student populations, new populations and to corporations across the US and worldwide. Again this needs to be done both at the University and local Faculty level. We at Manchester are only part way down our distance learning journey but we are in a better position than many in that we have a university distance learning academic director, dedicated distance learning operations and instructional design teams and pilot DL programmes led by passionate and engaged academic staff. 2017 will be a key year for us as an institution as we build our reputation in Distance Learning and our thanks go to all the staff at PSU who have contributed to this seminar and shared their hard-won distance learning lessons with us. Thank you.